Minimally invasive methods of diagnostics and therapy are playing an ever-growing role in medicine. Tissue-sparing surgical methods are more comfortable for patients and come with less risk of complications. ReLEx SMILE, developed by Carl Zeiss, is the first minimally invasive laser procedure (a keyhole procedure) for the correction of optical disorders. MYTH: SMILE ReLEx surgery is very new and its long-term results are not known. A: The first SMILE technology-based operation was performed by Dr Walter Sekundo in 2006 and the first LASIK surgery by Dr Ioannis Pallikaris in 1990. From the eye tissue perspective, SMILE surgery is similar to LASIK, except it eliminates the risk of flap displacement. Professional reports are continuously published which confirm that, in terms of results and safety, the SMILE procedure is at least equal to the LASIK procedure. Night vision disturbances and dry eye, however, occur significantly less with SMILE. both the laser procedure and recovery from it are painless. What makes SMILE so special? Unlike brand names like SuperLASIK etc, which have no special meaning, SMILE is an abbreviation of Small Incision Lenticule Extraction. Earlier laser procedures used an eximer laser, but this procedure only uses a femto laser. Without touching the surface of the cornea, the femto laser makes a cut in the shape of a lens in the deeper layers of the cornea. This part of the corneal tissue is removed via a hole a few millimetres in length. 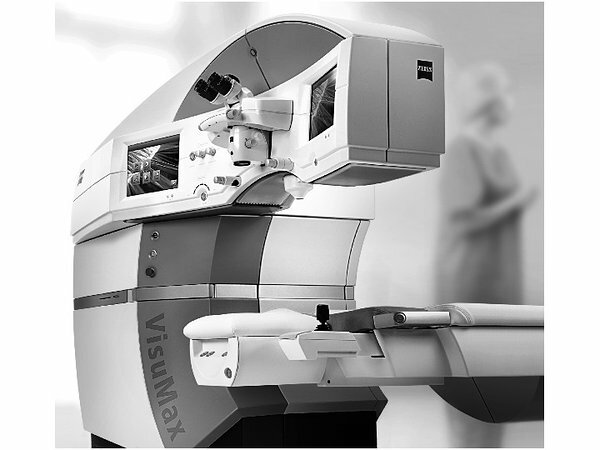 Such a surgical method is only possible when using Carl Zeiss’ Visumax femtolaser. 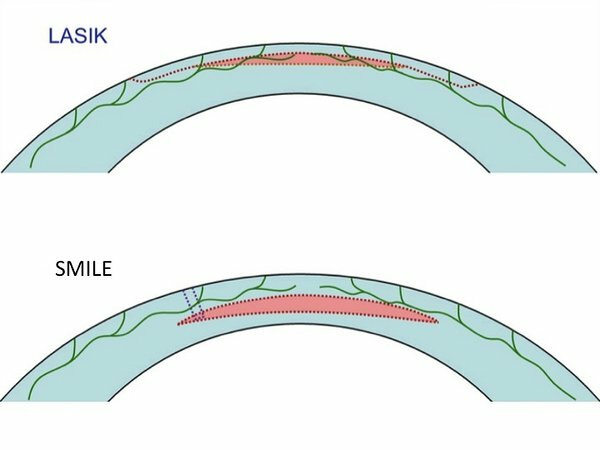 A corneal flap does not form when using the contact-free methods, so in what way are they different from SMILE? In the case of the surface ablation methods the superficial layer of the cornea (the epithelium) is removed. The basal layer beneath epithelium is made thinner using an eximer laser, and a contact lens is inserted into the eye until the epithelium has recovered. Working on the corneal surface itself results in much more pain and discomfort, and recovery of visual acuity is slower. Methods involving working on the surface of the cornea are not recommended for the treatment of marked short-sightedness due to the risk of fibrosis. The SMILE method combines the advantages of both surface-finishing and the LASIK method: a corneal flap does not form and the recovery of good vision is quick and comfortable. What experience is there with the SMILE method? Carl Zeiss is a recognised German company that has been known for the accuracy and quality of its optics since 1846. In 1986 it launched the first eximer laser, intended for use in refraction correction surgery to allow people to free themselves of glasses. Femto technology has been extensively studied over the years. Flap-free laser surgery procedures have been performed in controlled clinical trials since 2006. SMILE is becoming a standard method in developed countries for the correction of optical disorders. SMILE is characterised by remarkable stability in its results. 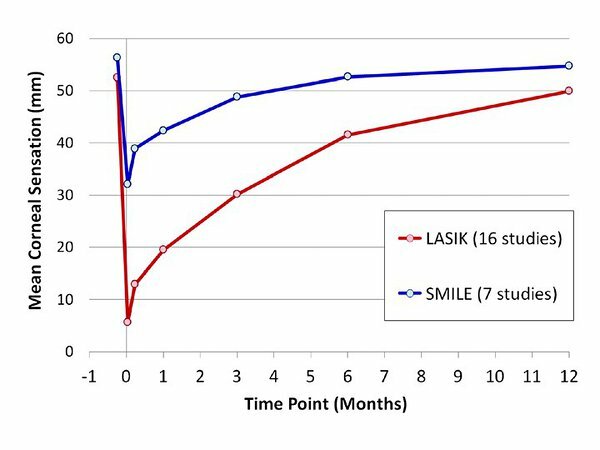 Studies have shown that the need for repeat procedures is in the range of 1-4% (depending upon the grade of short-sightedness) when using LASIK method, compared to just 0.3% with SMILE. The reason for such stability is the preserved, intact anterior lamellas of the cornea, which are able to support the shape of the eye more strongly than the lamellas located in deeper layers. The number of damaged nerve fibres is also one-third less, since corneal tissue is removed from deeper layers with the SMILE method. Studies have indicated that the sensitivity of the surface of the eye the day after the SMILE procedure is similar to that which is only achieved four months after LASIK surgery. More information about SMILE can be found on the Carl Zeiss website. The SMILE method makes it possible to correct short-sightedness in the range of -0.5 to -10 dioptres, and cylinder up to -5 dioptres.